Taken looking down High Street from about half way up. 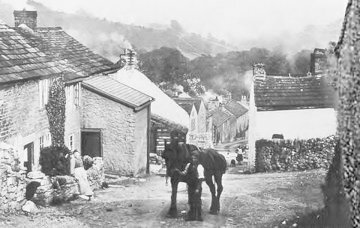 The picture shows a young boy with a Carthorse, which as the name suggests were use for their strength, pulling carts or ploughs for farming. It looks as though the boy is either on his way to or from a days work presumably farming. Stoney Middleton has what is believed to be the steepest High Street in Britain and given its condition in this picture which is rough and unmade would make it tricky for anything going up or down, it is hard to imagine how early motor cars would have negotiated it when they were introduced. A photographer would have been an unusual sight when this picture was taken, perhaps why the lady on the left sitting on the wall is looking so interested. Further down the street is another woman with her dog which looks like a Labrador.